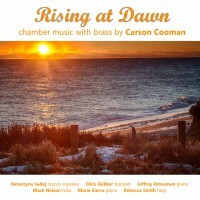 Chasing the Moon Down (2009), a cycle for mezzo-soprano, trumpet, and piano, was commissioned by trumpeter Chris Gekker and is dedicated to Gekker, mezzo-soprano Gail Collins, and pianist Stephen Brown. The texts are an interconnected cycle of poems by American poet Katherine Gekker. In the four poems, the speaker reflects during each of the seasons of the year—in the wake of a great loss.